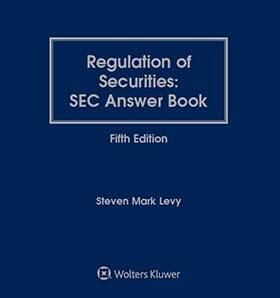 The new Fifth Edition of Regulation of Securities: SEC Answer Book is your guide to understanding and complying with the day-to-day requirements of the federal securities laws that affect all publicly traded companies and other issuers of securities. Whether you are a lawyer, accountant, officer, director, or investor, you will find helpful answers to most regulatory questions you are likely to encounter—in readable, plain English. The convenient Q&A format is ideal for beginners seeking a general understanding of a topic, as well as seasoned professionals grappling with critical issues. Twice-yearly supplements keep this valuable reference—now in its 17th year—current in this rapidly evolving field, and enhance its role as a core holding for every securities and corporate governance library.